When you select a target a vector appears from the target and your own vector changes. A colored dot appears at the end of each vector to show where each vessel will be at the time of CPA (closest point of approach). In essense this means that the vector length is the TCPA (time until CPA). In the example shown, the CPA is 0.34nm and the TCPA is 22:32. This means that the target and your vessel will be within 0.34nm of each other in 22 minutes and 32 seconds. This assumes both vessels maintain their current course and speed. 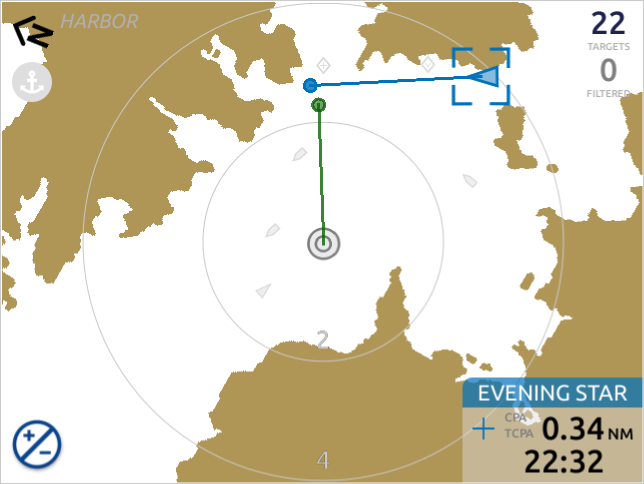 The blue dot indicates the predicted position of the target vessel at the time they will both be closest to each other (22:32). The green dot indicates your vessel's position at the same time. This example shows that the target vessel will pass in front of you. Note: If either your vessel or the target vessel is not moving, or moving very slowly, that vessel's dot may appear directly on top of the corresponding icon. This is consistent because it is telling you that at the time of CPA that is the predicted location of the vessel.